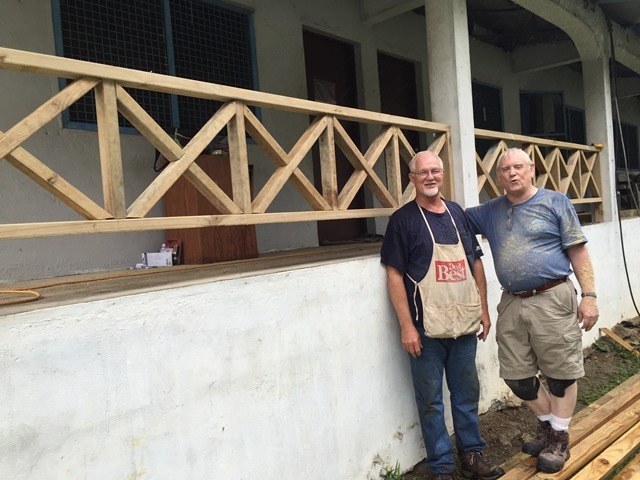 On July 31, David and Carl arrived from Indianapolis, IN (USA) to spend two weeks on campus helping with post-cyclone repairs. 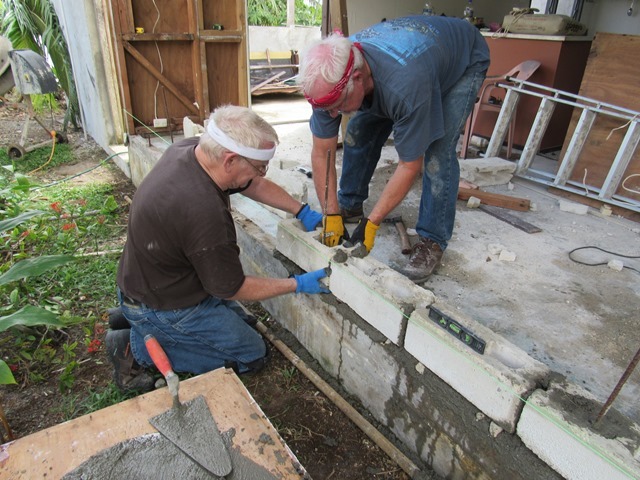 They did a lot of different things from building rails for the administrative building porch, to laying cement blocks, demolition, and new framing on the damaged staff house. We are so thankful for their willingness to just come and help out wherever they were needed. Thank you also to Lakeview Church, Indianapolis, for their generous gift to rebuilding the JBI campus! We are hoping you will come again! 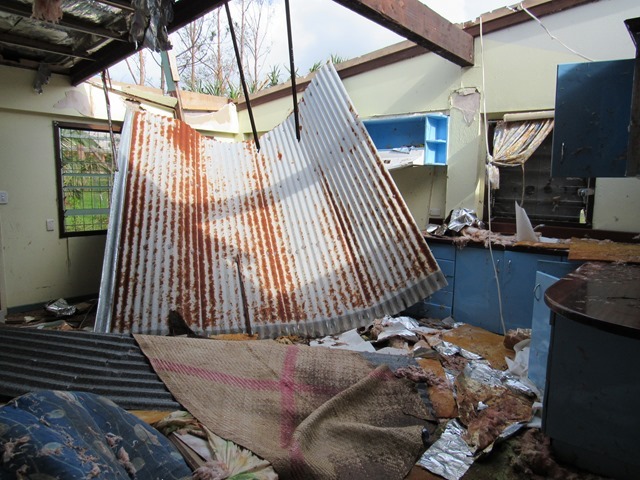 Thank you so much to everyone who has contributed towards repairing the JBI campus after Cyclone Pam. 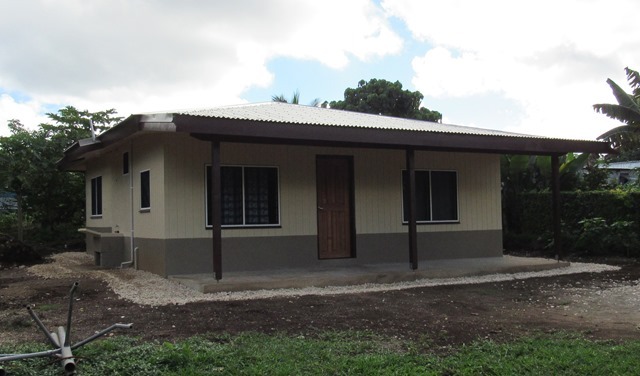 We were able to buy new metal roofing and timber, and order cyclone screws and brackets from Australia because of your donations. 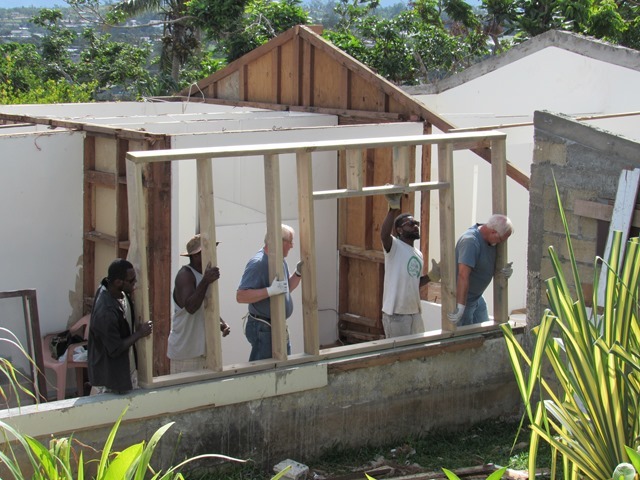 As funds and building materials became available, we were able to gather a local work crew to start repairs on the urgently needed girl’s dorm. The girl students have stayed in several different places on campus in the last couple of months as their dorm was inhabitable. They are anxious to get back in their own rooms. 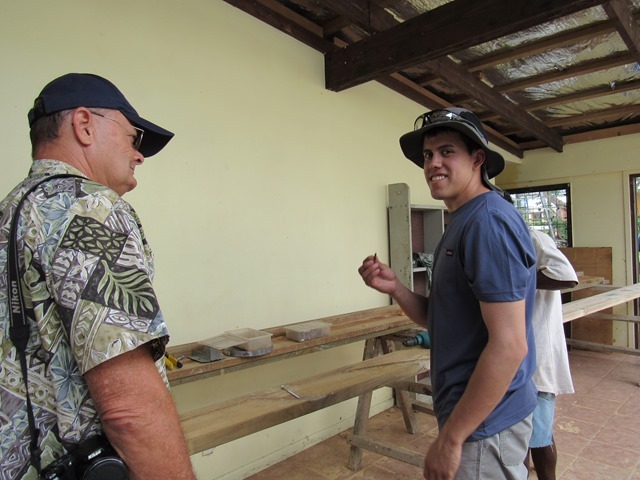 MAPS volunteer, Colton Cravatt, joined us on May 8, to help build. He is on his summer break from Ozark Bible Institute. There was a lot of debris to clean out of the damaged upper floor of the girl’s dorm. 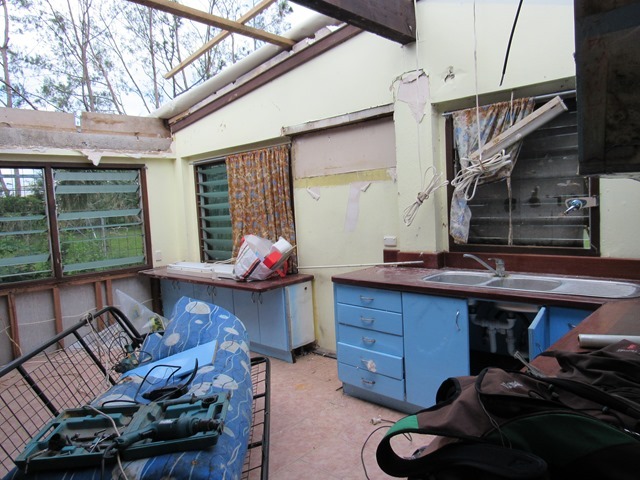 Part of the kitchen and living room roof was totally blown away by the cyclone. The rusty metal roof sitting in the kitchen area did not even belong to that building or any other building on campus from what I can tell! (see photo above). The blue kitchen cupboards are not salvageable, water damage has completely ruined the MDF. The solid wood countertops will be sanded down and re-varnished to use on the new cupboards which will be made locally. New timber roof structure was added as the roof was replaced. Cyclone strapping, brackets, and special screws were used to insure this roof will withstand the next cyclone. As sections of the new roof were finished, the electrician ran new electrical cables. New ceilings were needed everywhere as the old drop ceiling panels were whipped to pieces. 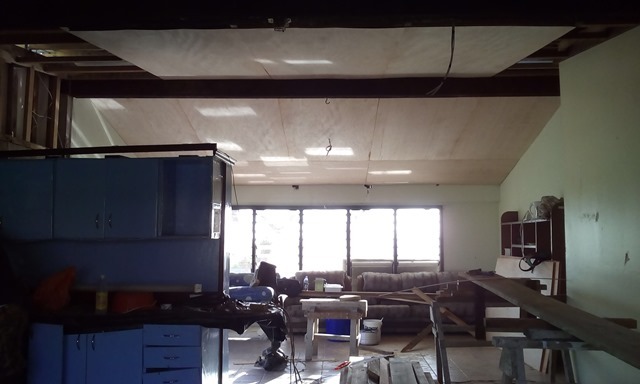 The new plywood ceiling is being completed this week and energy-saving LED lights will be installed. The electrical wiring and light fixtures had really needed updating so this is a real bonus. 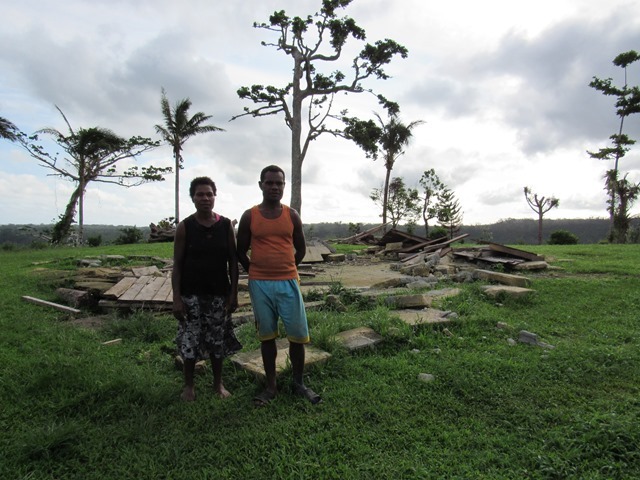 It is hard to believe that it is already 2 months since Cyclone Pam ravaged the central and southern islands of Vanuatu. I wish I could tell you that things are back to normal, but that is not the case. For many people rebuilding has not even started. Families are still in makeshift shelters or roofs still covered in tarps. It has only been in very recent days that fresh vegetable stalls are reopening. The produce is limited to a couple fast-growing crops like green beans and Bok Choy cabbage. But it is encouraging to see that the farmers are beginning to have a small income and we have a few vegetable options. 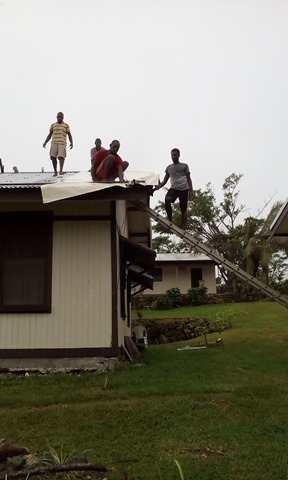 At JBI, about 3 weeks after the cyclone, we were able to get several sheets of iron roofing to fix a couple of roofs with minor damages. As the weeks progressed, building materials got harder to find and the waiting list for lumber and roofing materials got longer. Nails, screws and other basic supplies disappeared from the hardware shelves. Many of these things, we have had to specially order now. While we waited, the open roofs allowed rain to continue to pour in and cause more damage. It was a frustrating time as we only had enough tarp to cover one building and three others were left open to the elements. 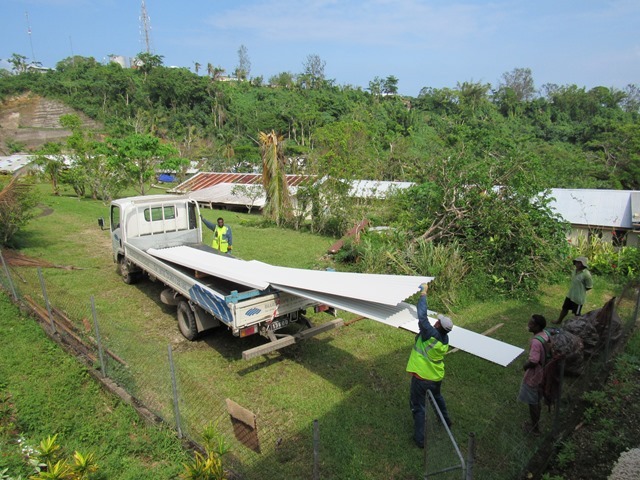 A big thank you to Steve and Helen Blake for giving us enough roof canvas material donated by an Australian company, Wax Converters Textiles WCT, to cover up our remaining damaged buildings. 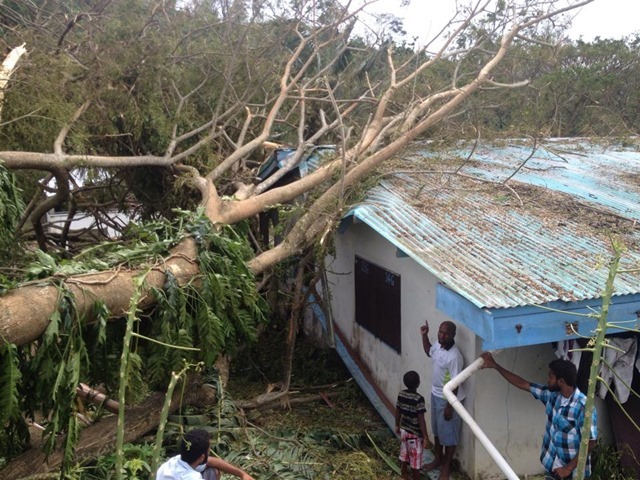 The JBI students have gone beyond the call of duty this term and worked so hard to cut up the fallen trees, cover campus roofs, relocate to smaller rooms, and distribute relief food. 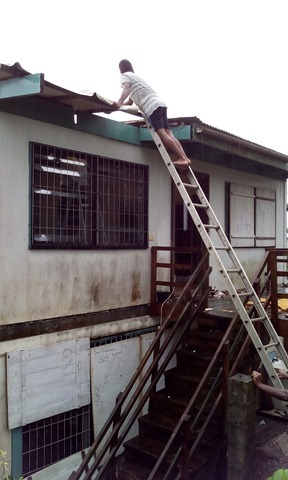 After a month of waiting, on May 9th, we received the roofing to fix the girl’s dorm and the guy’s bathroom/workshop building. The cyclone roofing screws arrived a couple days later so the work could begin. 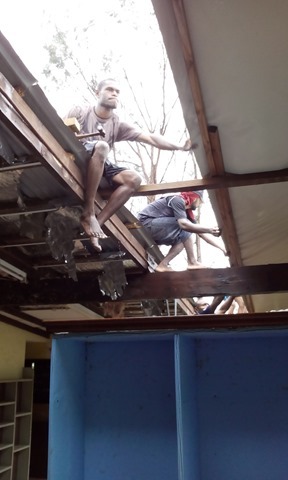 So a small crew has been busy taking the remaining roof of the girl’s dorm off, replacing broken rafters and purling before putting on the new roof. We are very happy to have some unexpected help from Colton Cravatt from the USA. Thank you to those of you who have sent in special offerings to help us repair the damage. 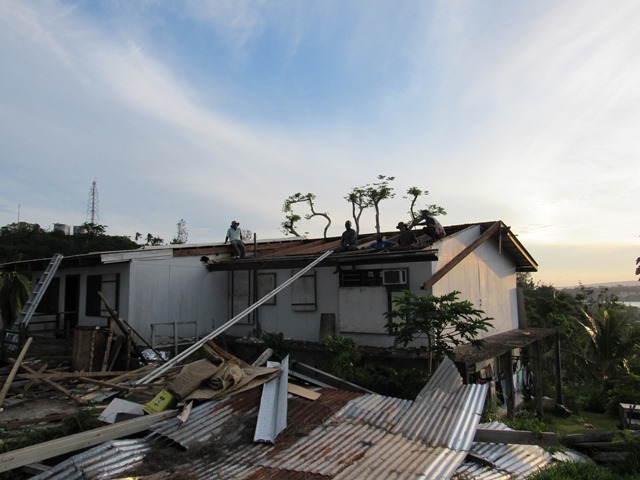 We have received about 25% of what we need to rebuild. 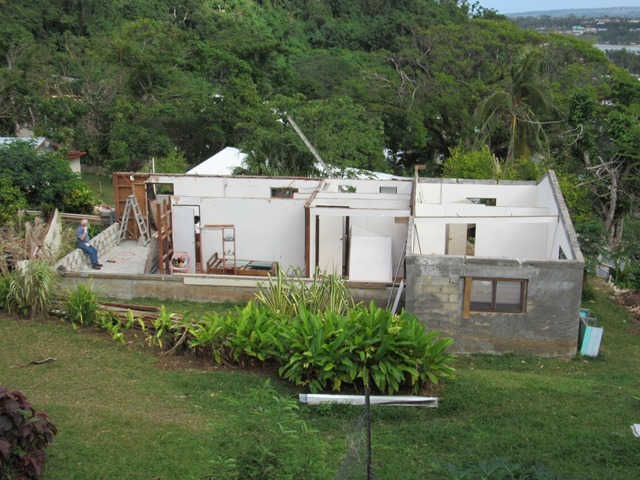 If you would like to give towards rebuilding: please label your gift Project #5619 and send to our AGWM account. 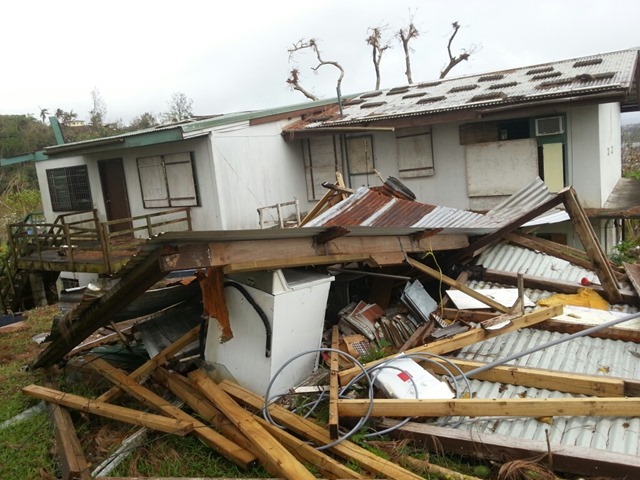 Joy Bible Institute was heavily damaged by Cyclone Pam. This is a photo of the girl’s dorm lounge and kitchen. The roof blew off and fell inside. Torrential rains poured in and flooded the whole house. The ground floor of this building is the school’s library which was in turn flooded. Water was ankle deep in the library after the storm. We do not know if any of the 3000 library books or furniture will be salvageable. 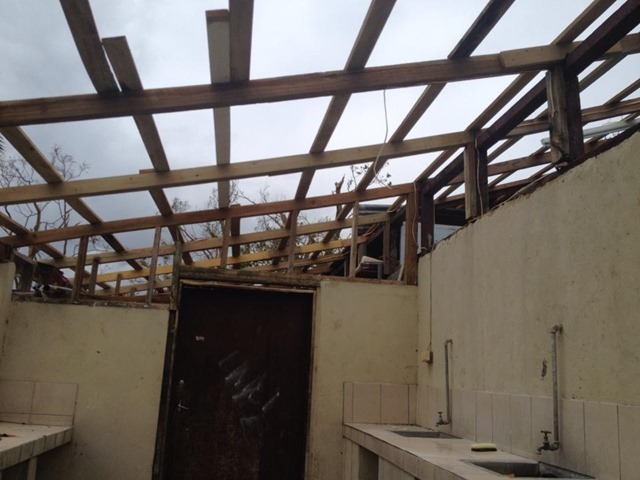 The roof of the boy’s bathhouse, laundry and workshop was totally blown away. This is a picture of the girl’s dorm (above) on the left and a pile of rubble on the right. That rubble used to be a very nice storage shed for tools and a carport where the girls hung their laundry. The windows are still boarded up as Cyclone Nathan on the Australian coast was forecast to possibly pass through Vanuatu this week. 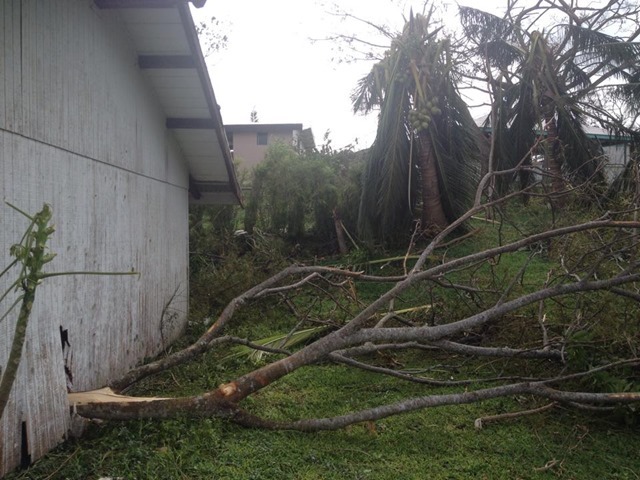 At the school’s administrative office and guestroom, two large trees fell on the building. On the front side, the roof is very damaged and a lot of water also went into the rooms. Visiting teacher, Maurice Nicholson and his son Ian, were sheltering here during the storm. We thank the Lord for protecting them. 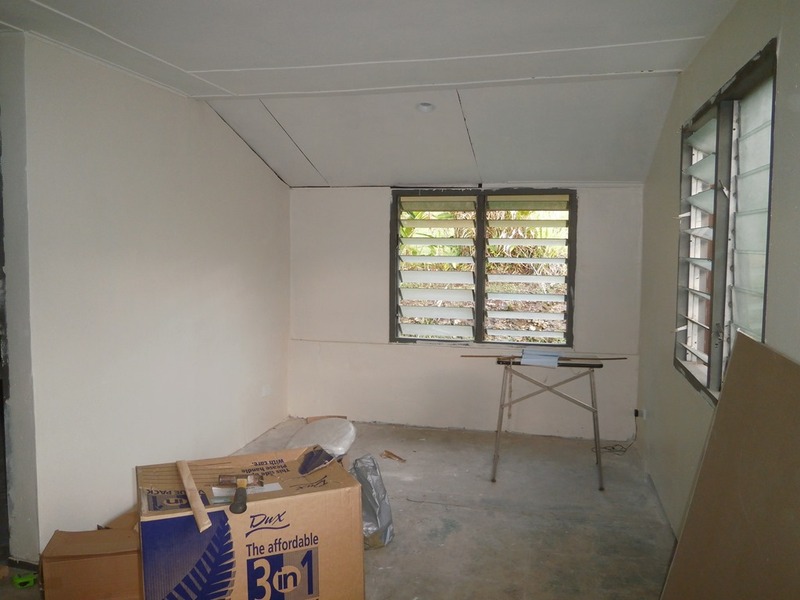 On the left is a picture of our Dean of Students house which we just finished renovating in December 2014. New electrical wiring and light fixtures were installed. The bathroom was gutted and redone, new kitchen cupboard added, paint and flooring. 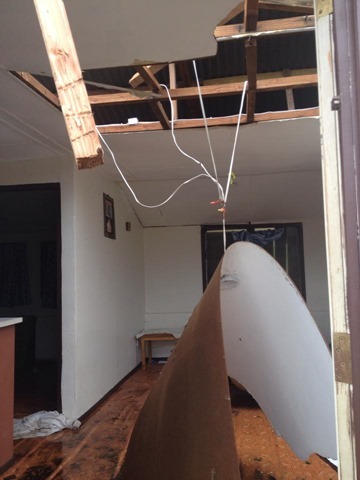 Unfortunately, the cyclone took off the front half of the roof and water soaked through the ceiling and it collapsed inward. Furniture was also ruined. Another section of the roof went off in the master bedroom. 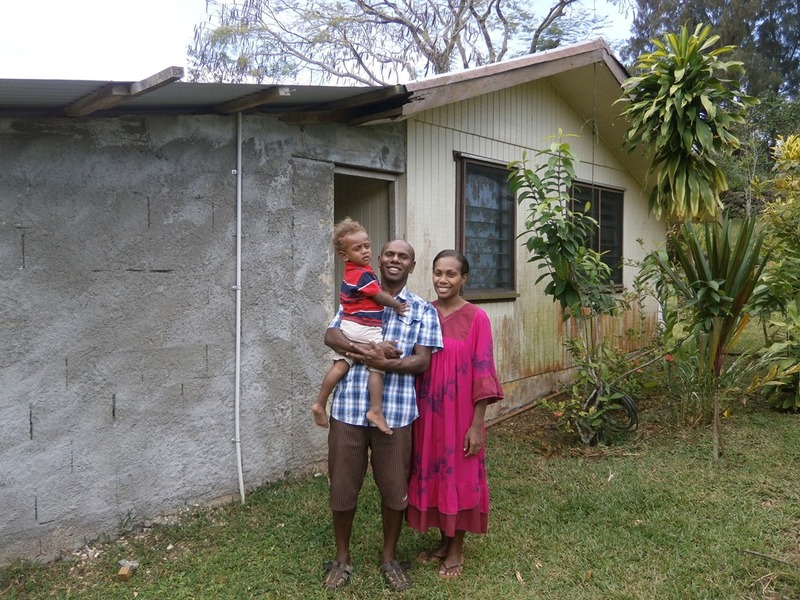 Pastor Kiel and his wife had a daughter born just a few days before the cyclone hit. 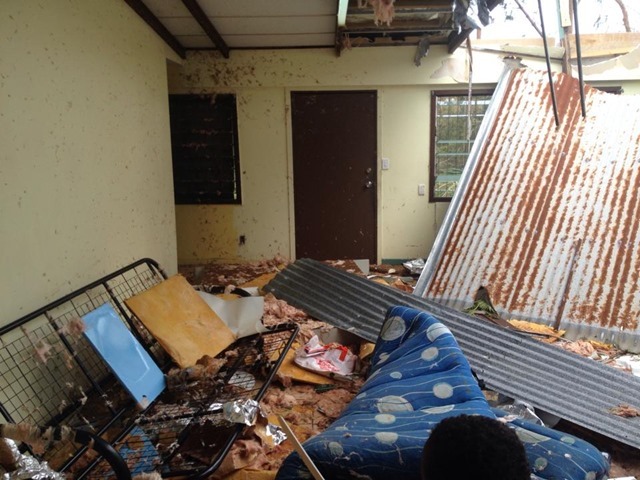 They were in this house with their two children and our female JBI students sheltering from the storm when the roof went off. As the high winds were thrashing things inside the house, they ran out through the night to another building for shelter. That is an extremely dangerous thing to do, as flying objects are what often kill people during cyclones. Again we thank God for his protection over them. 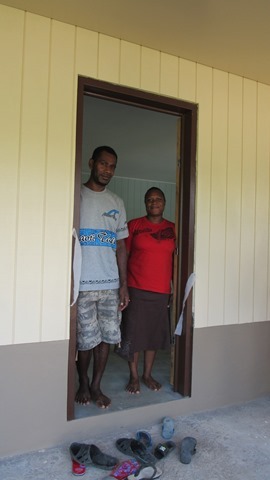 We are so thankful that the baby was born just before the cyclone arrived as the maternity ward at the city hospital is now damaged and closed. 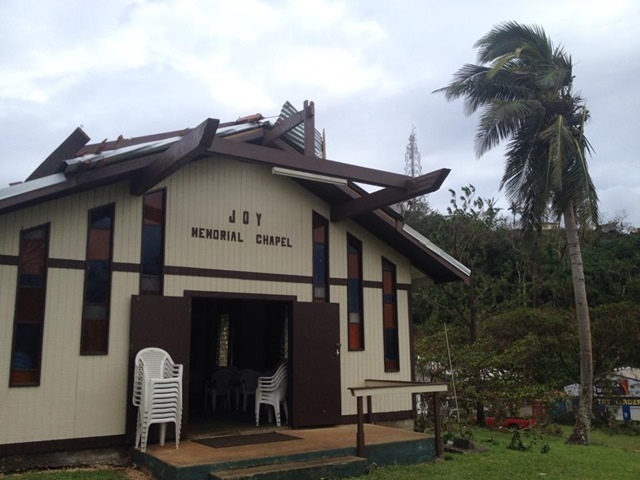 The porch roof on the Joy Memorial Chapel was ripped off also. The rest of the roof did not fly away though. Thank you to Michael who came and replaced the steel cables which hold the roof down to the ground a few months ago. Without the new cables, I think the whole roof would have come off. 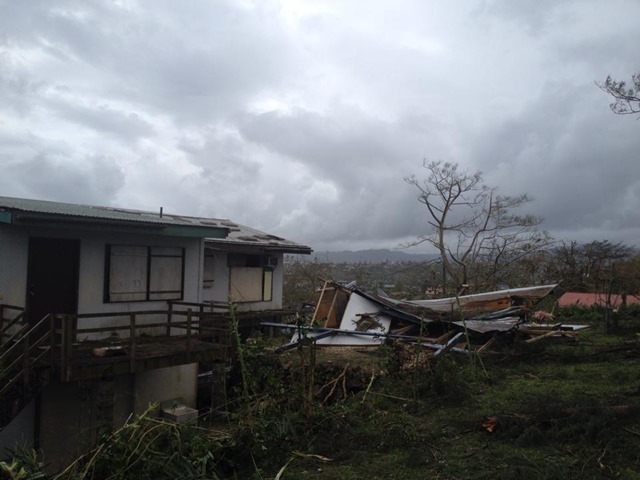 The three newest concrete buildings to the campus; the classrooms, the married dorm, and the new mission house, all survived the storm. They have some water damage and some buckled roof ridging but all in all they held remarkably well in the face of winds of 320kmph. The students took refuge in one of the classrooms and another teacher and his family camped out in the other. In the photo to the left, you can see a tree branch which has pierced the siding of the old classroom building. There is a lot of school equipment and furniture that has been damaged by the flooding. We do not have a list of everything which we will need to be replaced. We are so grateful to Tony for taking pictures of the damage for us. 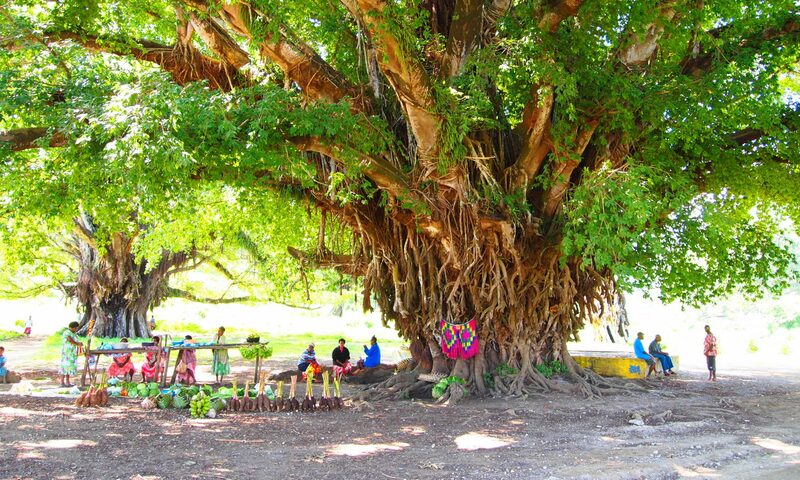 We are still in the USA and due to return to Vanuatu on March 28. At this point, we estimate needing at least US$150,000 to begin to adequately replace the things we have mentioned in this article. Thank you for considering the needs of Joy Bible Institute. Renovations have continued to progress on the old staff house. It has given us a few surprises and a few extra expenses along the way. At this point, I am happy to say it is almost finished, though we are about $1000 over budget. An electrician rewired and installed new recessed LED lights and switches. 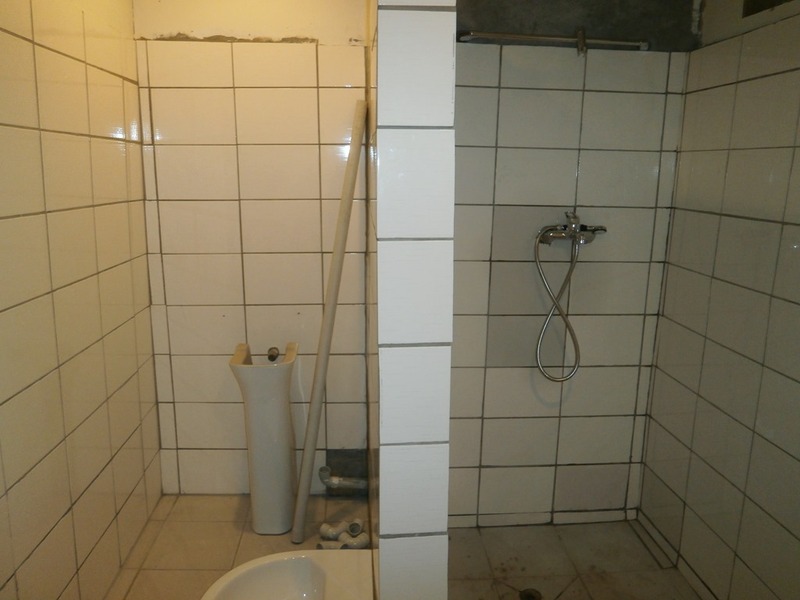 The bathroom was torn out, opened up and tiled. All new bathroom fixtures were installed too. Extra kitchen cupboards have been built. Now we are at the painting stage. The inside has already been done and the outside will be done this week. Everything should be completed in time for Christmas. I did not expect to start any new construction projects this late in the year but several things including the soon arrival of a new baby made this project a bit more urgent. So we launched into a partial renovation of the old teacher’s house today. It is late at night and I (Lori) just found some more termite mud in my hair. The work crew took out some ceiling panels this morning and found…yes, unfortunately, it was termites…so I was up on the ladder poking my head through some tight purlings to evaluate the sad condition of things. Anyway, this lovely family, Kiel and Faith Maimai, have a sweet little boy Harry Joshua and he is soon to have a baby brother or sister. They have been living in a guest apartment for several years and need a regular house. We are happy to have a campus house for them, but it has not been lived in for about 4 years because it needs repair. 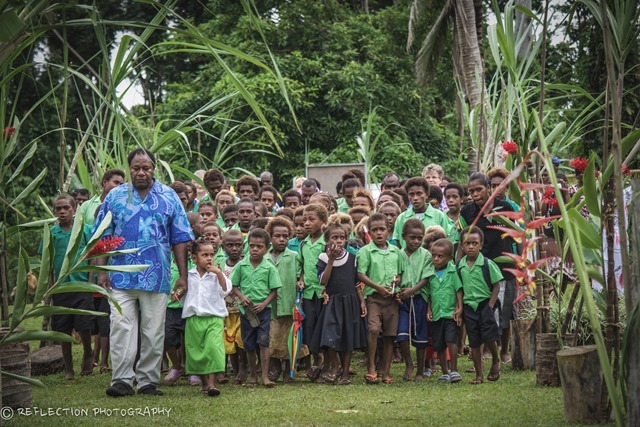 Pastor Kiel is the JBI Dean of Students and full-time teacher. The house has obviously been added on to over the years but nothing was ever quite finished. I’ll spare you the photos but we ripped out the only bathroom today. The house will also need to be rewired as the electrical wires were a real rat’s nest in the attic. 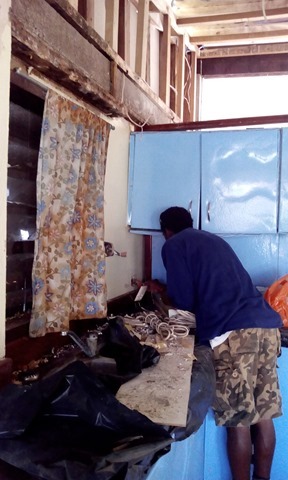 Would you please consider a gift towards the renovation of this campus house. We have about 5 weeks of work ahead of us and I need about $5000. The JBI campus project number is 5619. Thank you.